My goal is to share real estate market news and information as it affects the greater Indianapolis area. My dominant area of expertise is the North East corridor. This includes Fishers, Noblesville, Carmel and Geist. Not only will I bring local information to this blog but also information that affects the greater real estate market. Enjoy, profit and be informed. ordered business cards from www.printastic.com. They did a great job for me and it was fast, easy and inexpensive. Absolutely will do again. Good business tip! Rent to own: Good idea or bad idea? Personally, I think it's a bad idea. Really bad idea. Note: I consider lease/purchase and rent to own the same thing. Although they are technically different, I put them in the same category. So if I refer to "rent to own", I'm implying both. When you rent to own, you put TOTAL CONTROL of the transaction into the seller's hands. The seller dictates to you all terms as to price, condition, interest (if applicable) and amount applied to purchase. You have ZERO control. When you BUY a home, you want to get the VERY best deal on a home that you can. ALWAYS think resale on the home you purchase. Always! Whether it's in 2 years, 10, 25 years or your estate, always think resale. If you enter the property at too high of a price, you will have extremely difficulty in recouping your investment or making money on the home. cash. It's always king and talks the strongest! Early in my real estate experience, I tied to do rent to own transactions. NONE of them worked. It was frustrating for all parties...lots of disappointment and even anger. As a realtor, I have a fiduciary responsibility to represent you well. This means I have to have your best interest at heart. I cannot in good conscience do the rent to own/lease purchase with that in mind. I simply don't do them. So.... you might ask: "what do I go?" Rent for a season and get your house in order. Pay off credit card debt, increase your income, live on a budget, clean up your credit report, SAVE MONEY, let life circumstance have a clear sense of direction and get ready to buy at sometime in the future. Budget as though you are a homeowner, not a renter. Get to the point that you can get PREAPPROVED for a mortgage. Once that's done, THEN YOU HAVE LEVERAGE! Then we can go and ask for closing costs, ask for a better deal, negotiate for the best situation and you have some control. Remember on the rent to own/lease purchase, you are simply along for the ride for whatever the seller wants to do. You have NO CONTROL! I hope this provides some insight into this issue. This is not a popular post with some...that's fine. The ones who really promote the rent to own are the ones who stand to profit the most. Call me if you want to talk further. The Demand Institute, a nonprofit think tank operated by The Conference Board and Nielsen, predicts an uneven recovery for the U.S. housing sector over the next five years. The study says it wont be until 2018 that the median price of single-family homes will be near the peak reached in 2006, before the housing crisis began. But some states will get there faster than others. The study showed that among the 50 largest metros where housing prices are expected to appreciate between 2012 and 2018, the top five metros (Memphis, Tampa, Jacksonville, Milwaukee, and St. Louis) will see increases averaging 32 percent. The five cities projected to have the lowest price appreciation (Washington, D.C., Oklahoma City, Denver, Minneapolis, and Phoenix) will see gains of around 11 percent. "The strength of the local housing market is among the most telling metrics that helps us assess community health and well-being," says Louise Keely, chief research officer at the Demand Institute and co-author of the report. Researchers analyzed 2,200 cities and towns in the U.S. and conducted interviews with 10,000 consumers for the report. The report notes that the double-digit price increases of the last two years were largely driven by investors buying up distressed homes to meet rising rental demands. But the report notes that the main driver of housing demand for the next five years will be the formation of new households, particularly as the economy strengthens and employment rises. So, you are in the market for a new home? Great! You've set aside some time to take a nice drive to look at homes. On your drive you find a home that appears to be the type you are looking for. You make a call to the agent listed on the sign. Big mistake. See, here's the deal. When an agent lists a home for a seller, he charges that seller a fee (commission). Normally, when another agent brings a buyer to the home, that fee will be evenly split between the listing agent and the buyer's agent. However, if the listing agent is working with both the buyer and the seller he will get to keep the entire fee. A good payday for him, but no representation for you. Buying a home is probably the biggest financial transaction you will go through. You should have someone on your team to represent your best interests and make sure you are getting a great deal. This team member is what we call a "buyer's agent". The good news? They don't cost you a dime! As our example above shows, the buyer's agent will be paid by the listing agent. Now, I can hear you saying, "well the buyer's agent isn't really looking out for me, he just wants me to find a home quickly so he can get paid." Sure, there are plenty of agents out there who feel this way. You should not work with them, and if you are, you should fire them. Wait...what? That's right, fire them. Do not work with an agent who doesn't have your best interest at heart. You should have full confidence in your agent, so that when he says to walk away from a house, you run and don't look back. Make your home search a fun and successful one. Call around to various offices. Ask your friends and neighbors for referrals. Bottom line, find an agent you want to work with and that will be a great member on your home buying team! ActiveRain.com recently polled over 1,000 real estate agents to find out what they thought were the biggest mistakes being made by home sellers. 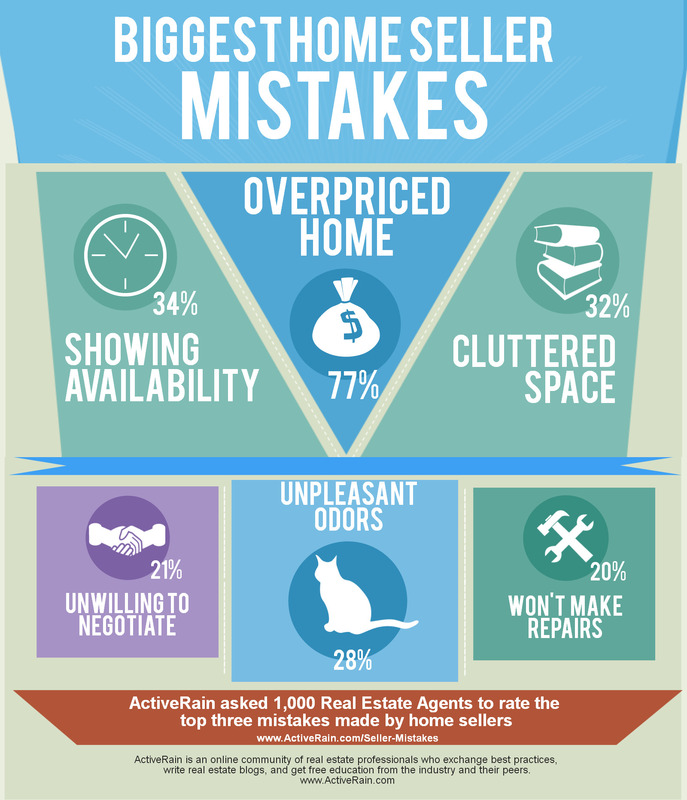 Check out the results below and let us help you minimize these mistakes when you go to sell your home! Have you ever wondered what type of home you could purchase with $800,000 or more in Fishers, Indiana? Well, we have all of the latest luxury homes in one place! Check out these amazing homes! Click the link above to see photos of a few awesome homes. Enjoy! These real estate market statistics are specific to the Noblesville zip code of 46062. Let's take a look at the two charts above. Both charts are for November and include all homes that were sold for at least $100,000. In 2013, 55 homes were sold. 2012 had 52 homes close. Both periods then, had almost identical volume. However, the first big number that jumps out to me is the average sales price! Over a $20,000 increase in just one year! Then look at the average days on market. This fell by over 30 days, a whole month! 2013 was a great year to be a seller on the west side of Noblesville. If you are currently looking to buy in this wonderful city, we would love to help! Give Robert a call at: 317-218-7867. Or if you prefer just to browse, CLICK HERE, to see the most current homes for sale. Text "home" to 77948 for instant download of our smartphone/tablet app! These real estate market statistics are specific to the Noblesville zip code of 46060. In the chart below you will see all the data for all homes that closed in November 2013 for over $100,000. As we head into the slower season of real estate it's interesting to note that the Average Days on Market, or DOM, was only 61! This is fantastic news for sellers. The other number, circled in red, shows an average sales price of almost 97% of the list price. Both of these are signs of a good seller's market. If you are currently thinking of selling your home, we would love the opportunity to earn your business. Our approach to selling your home is slightly different than other Realtors out there. Learn a little more about our very effective marketing strategy by CLICKING HERE! If you are currently thinking of purchasing a home in the Noblesville area, HERE is the most current list that you will find! Our site pulls all of the most up to date information from the MLS and, if you register for a FREE account, these listings can be emailed to you as soon as they hit the market! Try our Advanced Search! In homes in Fishers, IN, there are currently 137 homes listed at $250k and up. They range from $4,850,000 to $250,000. I ran the report specifically at $250k+. Fishers is a great community and has tons to offer. the Average DOM (Days on market) is 99. In other words, it would take an average of just over 3 months to sell your home. The average bathrooms is 4. This isn't surprising since they are all above $250k. Days on the market is an important consideration in the health of the market. This graphic depicts this pretty well. All in all, Fishers is a GREAT Place to live! 108 homes were sold in Noblesville, during August 2013. The average home sold had 3 bedrooms, 3 baths, and 2,080 square feet. These prices make an average sale of 97.26% of the listing price. 61 days was the average Days on Market for homes that closed. To see a complete list of the newest listings in Noblesville CLICK HERE! The statistics for this August2013 Noblesville Real Market Report were found in the local MLS. If you are interested in a home in the Noblesville area call me at 317-218-7867 or visit my website at: http://www.homesaleindy.com/noblesville/ My website will bring you the latest and most current MLS listings. You can also setup a free customized search that will deliver homes that match your criteria right to your email inbox! I specialize in real estate transactions on the north east side of Indianapolis to include the areas of: Fishers, Noblesville, Carmel, Geist, and McCordsville. I look forward to helping you in your home search!